If you’re like me, you’ve tried a lot of different auto shampoos in search of a product that works at all levels. We end up with 4 or 5 different products in our arsenal to meet different needs, and inevitably some of it goes to waste. About a year ago a highly respected detailer recommended that I try Chemical Guys Citrus Wash and Clear (CG CWC), so I gave it a shot. Per Chemical Guys, CGCWC is a pH balanced, hyper concentrated, biodegradable shampoo that can be used in a low ratio for daily washes, or a high ratio for paint preparation (stripping of waxes and sealants). Since most of my work involves machine polishing, I was really interested in its ability to safely strip waxes and sealants that can interfere with the polishing process. Some heavy gloss enhancers (found in many auto shampoos) along with waxes and sealants will form a barrier between the polisher and the painted surface. Many times this barrier will cause the polish to react in a less than desirable manner, or it may cause the polishing pad to skip or hop. 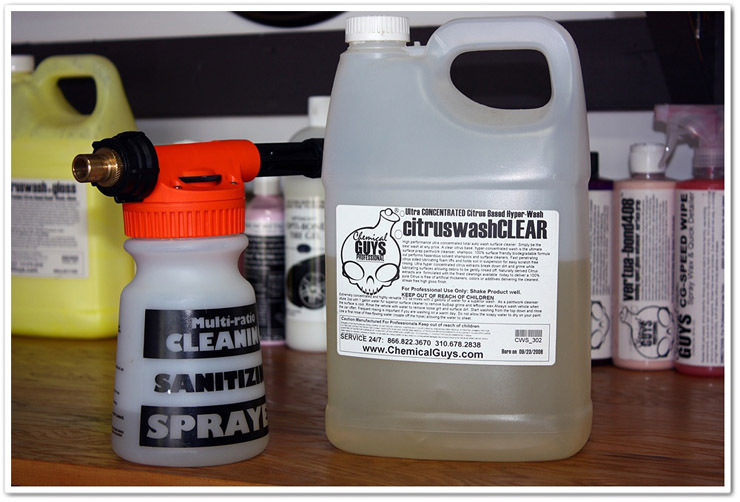 As with most Chemical Guys products, CG CWC is very concentrated. Directions call for just .5 oz to a gallon of water for your regular wash (this ratio will NOT strip wax!). If you buy in a gallon, that is a lot of washes! For paint preparation, mix 2 oz per gallon of water. Not only did I find CG CWC to be high-sudsing at either ratio, but it also has a high level of lubricity to ensure your wash media glides gently across the surface of the vehicle to prevent damage to the finish. A high quality wash like this will gently lift and hold the soil in suspension for a scratch-free rinse. As a daily wash, CG CWC does a tremendous job of safely cleaning the vehicle, and it leaves a nice glossy finish as well. And at only .5 oz per gallon, it will last a long time! If you have a Gilmour Foamaster II Foam Gun, you will find that it is a joy to use it with Citrus Wash and Clear. It produces rich, thick foam that clings to the surface of the vehicle to breakdown the heavy dirt prior to washing. I will typically foam the car, let it dwell for a few minutes, and then perform a regular wash using the 2-bucket method and a sheepskin mitt. Another great use for CWC is to strip any polishing oils or compound dust off of the car before prepping it for wax or sealant application. There are some polishes that will leave oils behind on the surface that can interfere with the application of waxes and sealants, and this is a quick and effective way to remove them. All I need to do is apply a thick layer of foam all over the vehicle, then hose it off, and it’s ready to go! If you like to try different waxes and sealants, then you definitely have the need a product like this to strip the previous coat and start with a fresh clean surface for applying something new. 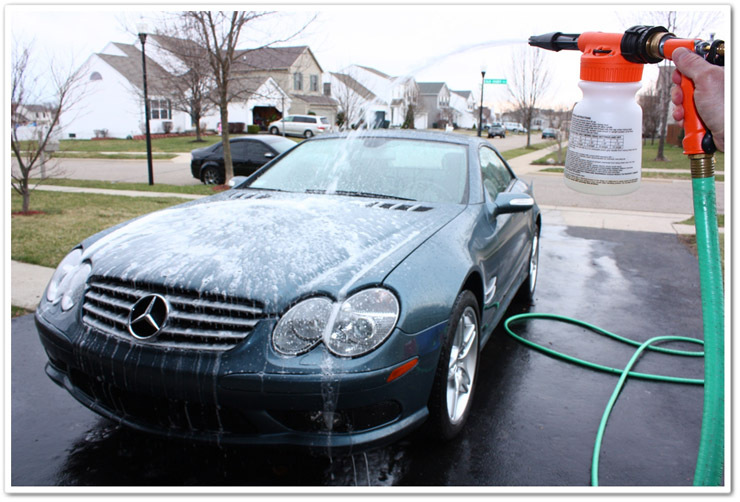 In summary, I find CG CWC to be extremely versatile, and quite effective weather you’re performing a daily wash or prepping the paint for polishing. It’s great to have one product that will cover so many needs, and because it’s so highly concentrated, you get a lot of value as well. I highly recommend Chemical Guys Citrus Wash and Clear, and couldn’t imagine not having it in the Esoteric garage! I know this blog is pretty old so I hope you get this. I recently purchased the new Chemical Guys Citrus Wash. NOT the wash and clear. How much of the cap should you fill with solution when mixing with a gallon of water when trying to strip wax from the paint? I dont have a measuring cup to measure oounces. Thanks! I don’t know how much volume the cap holds, but I do know that you need 1 ounce of Citrus Wash per gallon for paint prep ratio. 2 tablespoons equals 1 ounce, so this should be a little easier if you don’t have a measuring cup (and not many of them measure down to just 1 ounce). I bought the FMII while it was on sale, kinda of a dumb question but when adding the CWC with the foam dispenser, how much of the citrus wash do i put? I got confused as I did the recommend 1oz per gallon (I believe its setting D or E on the gun), and added in only 1 oz of cleaner + water to fill. When I sprayed on the foam, I only got a 1/4 or so of the car foamed before I was spraying water. was I correct on my mix or should I have added more? I know on my 5 gallon bucket, I do 2oz and fill it about half way (with suds filing the rest of the bucket). Just a little clarification please. The rest of the stuff I got from DI has been amazing and I’ll be looking forward to getting more supplies in the future. How much solution you put in the Foamaster doesn’t really matter because the final ratio is set by dial. I’ll usually add a little water in the container as well just to create some additional foam. Sure, this dillutes the ratio a little, but that’s OK. When I use my foam gun I’m mostly using it as a pre-soak and/or a way to add some more lubrication to the surface. I’ll still use my normal wash method with 2 buckets and have a regular wash solution in there as well. I hope this helps! My question is sort of similar to Don’s. I know the soap:water ratio inside the foam gun doesn’t matter since we set the final ratio on the gun, but I wanted to know what letter to set the foam gun on so it doesn’t dispense a ratio that would strip the paint while doing a maintenance wash. Is this even something we need to worry about when using the gun? The “A” setting on the foam gun is for a ratio of 1oz/gallon. For maintenance washing, Wash & Clear recommends a ratio of .5oz gallon (2oz/gal for stripping). Given this, I would set it to “A”, and make sure you have some water mixed in the gun as well to further dilute it. Hi Todd ,I’m going to resealant my car ,and there is 2 coats of Black Fire Wet Dimond that i put on it 5 months ago . So do I need to remove the 2 previous coats or just washing the car and then apply a new coat of sealant on ? There’s probably not much sealant remaining on your car right now, but a strong wash would be recommended to help remove any that is remaining. If you’re in an area where you’ve gone through a harsh winter you’ll probably want to do a light claying as well. After all of this, you’ll be ready to apply a fresh coat of sealant. I read this thread several months ago and have been using CG CW&C ever since. Thank you for putting this out there for folks like us. You should use DAWN or Sunlight, it will strip way better and it will save money! that’s the proper way to do it. 1)What is the ratio of water to product that you put into the foam gun? 2) What setting do you have on the foam gun? I guess I should read the other posts before asking a question. Oops. He states in his review that 0.5 oz per gallon will not strip the wax. That’s 1/2 of a ounce per gallon. Todd wrote “Directions call for just .5 oz to a gallon of water for your regular wash (this ratio will NOT strip wax!). If you buy in a gallon, that is a lot of washes! For paint preparation, mix 2 oz per gallon of water.”. Doesn’t anybody read what he says?